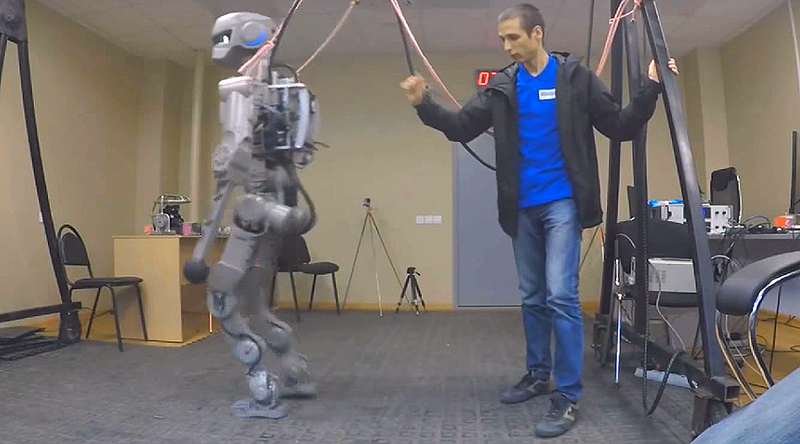 Android robot FEDOR, likely to be part of Russian manned space missions starting 2021, has displayed impressive handyman skills in a fresh video released by its developers. The footage shows FEDOR (Final Experimental Demonstration Object Research) executing several functions, including inserting a key, extinguishing a fire, getting into a car, using a saw and welding. In a video released in October, the Russian android was seen walking, drilling and even driving a car. The project was previously referred to as Avatar, as FEDOR can function both automatically and through a special avatar-suit, transmitting the movements of a human operator. The development of the android, initially planned to be used for rescue work, was launched in 2014. But, later, engineers announced that robot would be able to operate in various environments and potentially used for military purposes, education and even space missions. Rogozin said that he gave an order to adapt the android for the new Russian manned spacecraft program, suggesting that FEDOR could begin taking part in flight tests as early as 2021.